Using multiple site collections and web applications in SharePoint 2013 can lead to navigation boundaries and an inconsistent user experience when traditional SharePoint structured navigation is implemented. 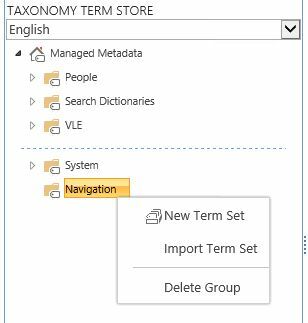 Using the managed metadata’s term store management tool it is possible to create a managed navigation using terms nested in a term set. 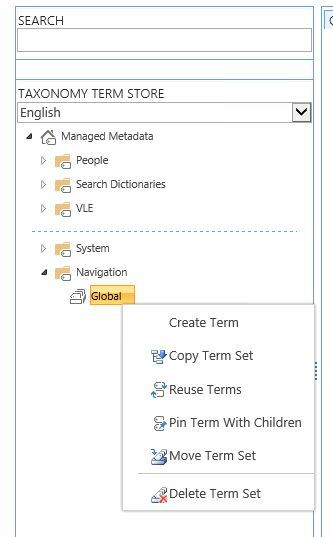 Before trying this navigation type, set up the managed metadata service in the SharePoint farm and ensure it is running. 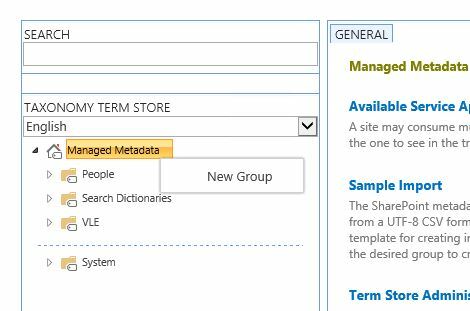 Create a new group in the term store management tool (as shown below) named “Group”. Create a new term set beneath the group called “Navigation”. Create 3 new terms in the term set. In the term set select the intended use tab, select use this term set for site navigation. In each term, select the navigation tab, enter a title, hover text, check show in global navigation menu, enter link and press ok (as shown below). 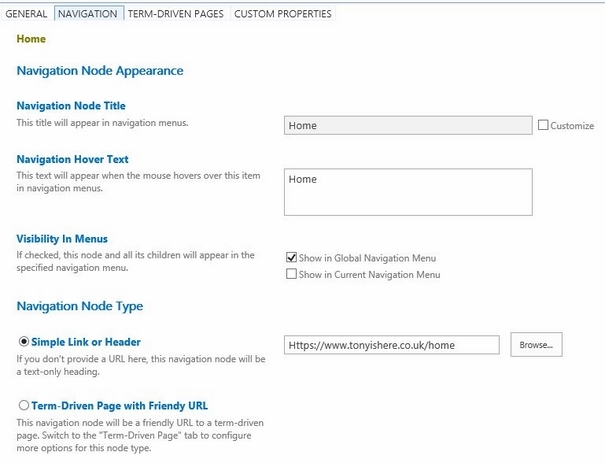 In the site collection settings, select “Navigation”. Select “Managed Navigation” in the global navigation section. 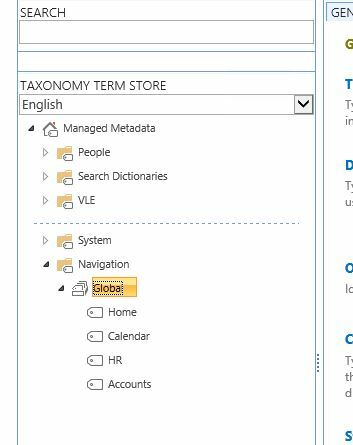 Select the term set and press OK.
Once this navigation method has been configured on each site collection, the administrator can control the navigation for all the site collections in each web application from the managed metadata. This can be permissioned so new links can be added by contributors or locked down. Note: Oslo Master Page has managed navigation menu hidden, use a Master Page based on seattle instead! This entry was posted in SharePoint 2013, SharePoint News, Tony Phillips and tagged Codnor, Derby, Hull, Managed Metadata, Managed Navigation, MMS, Navigation Settings, Navigation Term, Phillips, SharePoint, SharePoint 2013, SharePoint Design, Term Sets, Term Store Management Tool, Terms, Tony, Tony Phillips, Tony Phillips Codnor, tony phillips derby, Tony Phillips Hull, Tony Phillips SharePoint on May 28, 2014 by Tony Phillips.